The New KLH Industries.com | KLH Industries Inc. Precision machining is a game of numbers. Ballooned dimension #4 is 0.336” diameter with a size tolerance of +/-0.002”, a true position requirement of +/-0.004 inches, and a 45 degree chamfer. If you understood any of that, you’re probably an engineer. Searching for precision machining is a game in itself. Long lists of equipments models and unnecessary machine specifications. Companies claiming to be ISO-compliant but are not ISO-certified (be careful of that one). Hives of buzz words. Google quickly becomes a best, and then worst, friend. If you understood any of that, you’re probably a buyer. 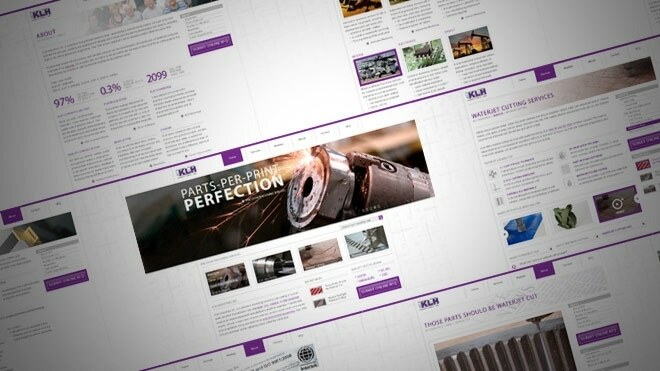 Whether you’re an engineer, a buyer, or both, life just got easier with the fully revamped KLH Industries.com. When it comes to precision machining services, the crew at KLH are experts. When there are a hundred machines capable of machining your part, you want the company with the expertise to do it. The new KLH Industries.com is out to prove just that. Every service and market page was crafted with an expert in the field. The service pages have the technical specs to satisfy seasoned engineers, enough general information to satisfy first-time purchasing agents, and enough pictures or videos to keep the interest of both. The new KLH Industries.com is an accurate representation of who we are today. From there, new and returning visitors are welcome to try out the online request for quote (RFQ) form. If you don’t know who to talk to, or just don’t feel like talking, the online RFQ is the perfect way to get the right information to the right person. If time is a factor, check the ‘Rush My Quote’ box and provide KLH with some more detailed information about your project. KLH sought to make the experience on the website as similar as the experience on the phone: knowledgeable, easy to work with, and effective. This shouldn’t be a game, after all.